Boeuf Bourguignon is a hearty dish cooler weather. Most often I post recipes that I have developed. Honestly, this recipe is one I have made for over 15 years now. I love this recipe; I make it once or twice a year in the cooler seasons, if you have never tried this recipe, you should. 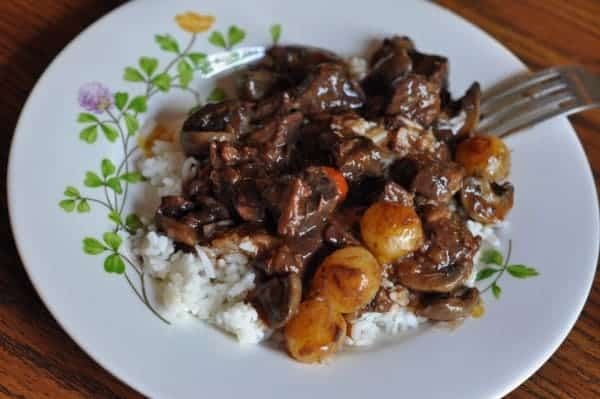 This dish is filled tender beef, mushrooms, braised onions, all in a thick savory sauce, try this dish once, and you will be a fan of Boeuf Bourguignon. So let me first say, this recipe does require a few, well a lot of extra steps, but I have made this recipe in the past with a few shortcuts, and the way that is recommended, there is a difference when you skip a step or two. My advice is to go ahead and do every step as written. Initial preparation takes a few extra minutes, but after that, you place your Boeuf Bourguignon in the oven and come back later. Best of all, if you have company over you can make this the day ahead, just like many stews this recipe gets better the second day. It is recommended to serve this dish with potatoes, buttered noodles, or even rice. I choose rice the last time; I used a Chianti in the dish, and I thought the sauce was sublime, and I didn’t want to miss a drop of sauce. The one drawback to this dish is that if you do not drink wine, I do not know of any substitute for preparing this dish. Make Beef Bourguignon just like Julia Child did. Remove rind, and cut bacon into lardons (sticks, 1/4 inch thick and 1 1/2 inches long.) Simmer rind and bacon for 10 minutes in 1 1/2 quarts of water. Drain and dry. (I have used a good quality sliced bacon in the store with good results. Preheat oven to 450 degrees. You will need a 9 to 10-inch fireproof casserole 3 inches deep, one tablespoon olive oil or cooking oil, and a slotted spoon. Saute the bacon in the oil over moderate heat for 2 to 3 minutes to brown lightly. Remove to a side dish with a slotted spoon. Set casserole aside, reheat until the fat is almost smoking before you saute the beef. Dry the beef in paper towels; it will not brown if it is damp (This makes a big difference) Saute it, a few pieces at a time, in the hot oil and bacon fat until nicely browned on all sides. Add it to the bacon. In the same fat, brown the sliced vegetables. Pour out the sauteing fat. Return the beef and bacon to the casserole and toss with the salt and pepper. Remove casserole, and turn oven down to 325 degrees. Stir in the wine, and enough stock or bouillon so that the meat is barely covered. Add the tomato paste, garlic, herbs, and bacon rind. Bring to a simmer on top of the stove. Then cover the casserole and set in lower third of preheated oven. Regulate heat so liquid simmers very slowly for 2 1/2 to 3 hours. The meat is done when a fork pierces it easily. When butter and oil are bubbling in the skillet, add the onions and saute over moderate heat for about 10 minutes, rolling the onions about so they will brown as evenly as possible. Be careful not to break their skins. You cannot expect them to brown uniformly. Place the skillet over high heat with the butter and oil. As soon as you see that the butter foam has begun to subside, indicating it is hot enough, add the mushrooms. Toss and shake the pan for 4 to 5 minutes. During their saute, the mushrooms will first absorb all of the fat. In 2 to 3 minutes, the fat will reappear on their surface, and the mushrooms will begin to brown. As soon as they have browned lightly, remove from heat. While the beef is cooking, prepare the onions and mushrooms. Set them aside until needed. When meat is tender, pour the contents of the casserole into a sieve set over a saucepan. Wash out the casserole and return the beef and bacon to it. Distribute the cooked onions and mushrooms over the meat. Skim fat off the sauce. Simmer sauce for a minute or two, skimming off additional fat as it rices. You should have about 2 1/2 cups of sauce thick enough to coat a spoon lightly. If too thin, boil it down rapidly. If too thick mix in a few tablespoons of stock or canned bouillon. Taste carefully for seasoning. Pour the sauce over the meat and vegetables. To serve immediately: Cover the casserole and simmer for 2 to 3 minutes, basting the meat and vegetables with the sauce several times. Serve in its casserole or arrange the stew on a platter sounded with potatoes, noodles, or rice, and decorated with parsley. For later serving: When cold, cover and refrigerate. About 15 to 20 minutes before serving, bring to the simmer, cover, and simmer very slowly for 10 minutes, occasionally basting the meat and vegetables with the sauce. Whew! A couple more comments of mine, yes, the small pearl onions taste wonderful, and don't add the small onions and mushrooms until the end, their flavors are wonderfully unique and add a lot of flavors. Again, I can't add anything to this recipe, but I would encourage you to consider making this wonderful beef stew sometime soon. I use the crock pot and let it simmer all day adding the mushrooms a hour before serving. It smells great all day.